Explorations in Quilting and Life: Ice Dyeing! I am in love with ice dyeing. 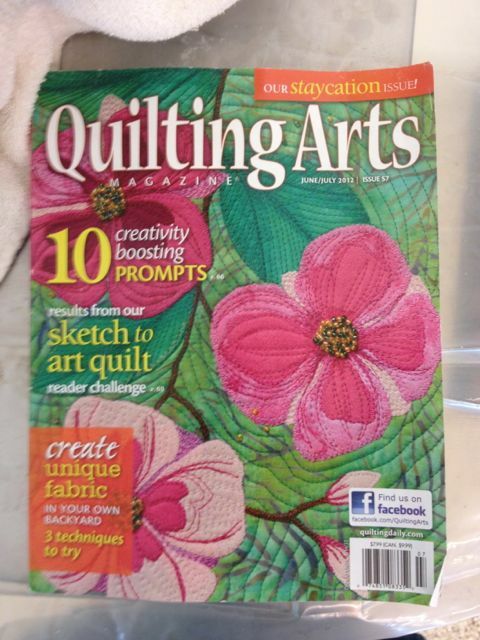 Much thanks to Quilting Arts Magazine for publishing an article by Carol Ludington entitled 'Dye Your Own Ice Parfait' in the June/July 2012 issue. I suspect the issue was handed out at SAQA's Expanding Horizons Conference in April as it was in my stack of reading materials for a flight out to Spokane in May. As I read the article, I knew that Carol was describing a manageable process for me. I ordered the dyes and a few other things so they would be here when I returned from the Arctic. 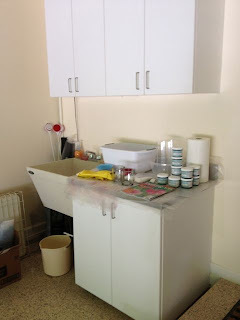 When we had the flooring replaced in our garage a year or so ago, we put in some new cabinetry and, looking ahead, I had a stainless steel countertop installed next to a sink. It was there that I collected my materials for my project. One great feature of this approach is that it does not require a large working area. In addition to what you see in the photo, I used a 3'x6' portable table top covered in plastic that I had constructed for a dyeing class I took several years ago. I was able to lay that on a railing near to my counter top work area. The actual dyeing process was simple - great for a beginner. Carol suggested using fat quarters. I was a bit more flexible. 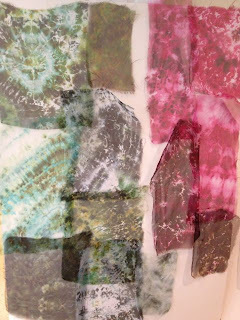 What I was looking for were some greens and reds to use in my current art quilt. I knew I wouldn't require large pieces so I cut some PFD cotton and silk organza in convenient size pieces for use with some smaller glass containers I had found on sale. After preparing the fabric, it was simple matter of stacking fabric, ice cubes, and dye in layers and letting them sit for a day. I wound up short on glass containers so I threw a piece in a ziploc bag as well. This entire phase of the process probably took me about an hour or so. Clean up was easy. This morning was time to rinse, wash, and iron my experiments. I am extremely happy with the results. Considering this is the first time I have dyed anything at home, I would say it is a great success. The organza looks fairly light in the photo as it didn't photograph that well. I will be using it in layers to build up areas of color so it is pretty much what I was hoping for. The cottons are more vibrant in color, as I might expect. I plan to use some of them as back drops on which I will layer the organza. The ziploc bag piece is in the upper right corner of the cottons photo. I am really pleased with how it turned out. I expect that Carol has finally gotten me through the door and into the world of dyeing my own fabrics. I am sure I will still visit my fabric shops with an eye out for the perfect colors. It just in nice to know that I also have the option to create what I need. P.S. I am linking this up to Nina Marie's "Off the Wall Friday" posts. Check out what others have been doing! Looks like you're having a great time! And....um...the magazine? I believe it was in with that fabric you won... ;-) Glad you're enjoying it! These look great! 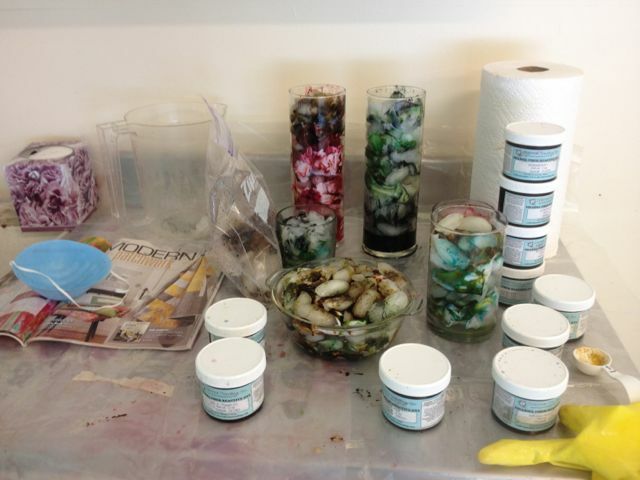 I haven't tried dyeing organza - it must have been silk, right? Looks like you will have lots of fun in the snow next Winter. 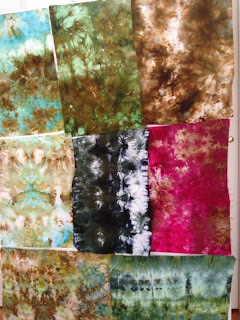 I haven't tried dyeing my own fabric but your wonderful results may give me the courage to try! Thanks for sharing your experience! Very fitting after a trip to the Arctic! Great results, seems fun to do! Thanks for posting this Judy, I have read that mag and have found the instructions in several of the articles to be interesting. I think I may try that this summer. Beautiful results! And it looks like a fun technique! Your ice dyeing turned out very nice. I have given it a try too. I also loved the results but have had trouble using them. I think ice dyeing the organza is a great idea. I'm thinking I could use some of that. Awesome results! Can't wait to see what you create with them.